A little reminder that humans do very, very cool things when we work together to increase our understanding of the Universe around us: The Japanese Space Agency (JAXA) has successfully landed a pair of hopping rovers onto the surface of a tiny asteroid 320 million kilometers from Earth. The Hayabusa-2 spacecraft has been hanging off the side of the 900-meter-wide diamond-shaped asteroid Ryugu since late June, taking images of the wee rock and mapping its surface. On September 11 and 12 it made a practice descent down to an altitude of about 600 meters to make sure everything worked well, then returned to its 20 kilometer station-keeping “home” position. Then on September 19 the real run began. The spacecraft began its slow approach once again, this time dropping to a heart-stopping 55 meters — about half the length of a football field! At this point, on September 21, it released the two landers, called MINERVA-II1 A and B. On the left is an image from rover A showing the Hayabusa spacecraft on the right and the surface of Ryugu on the lower left. The right image is from rover B, and you can clearly see the rock-strewn surface of Ryugu (and a splash of light, probably sunlight reflected inside the camera). Then, sometime before 02:44 UTC on September 22 (I’m waiting for the official time announcement), the rovers touched down on the surface! This is the first successful landing of mobile probes onto an asteroid*. Amazing. This shot looks like it’s from a movie! But even cooler: It was taken during a hop. The rovers don’t have wheels and don’t drive around the surface like, say, the Mars rovers do. The gravity of Ryugu is far too weak for that. Instead of being cars, the rovers are actually small cylinders — and I do mean small; they’re 17 centimeters across by 7 high and weigh a bit more than one kilogram. Picture a stack of about five lunch plates and you’ll get a good idea of their size. Inside each rover is a small, off-center motor. When the motor moves, the rover responds by moving in the other direction, causing it to hop off the surface (a second, much slower motor is used to aim the first motor so the rover moves in the correct direction). I think this is amazingly cool: If you can’t crawl, bounce! And that striking image above was taken while the rover was off the surface bounding from one spot to the next. As I write this I haven’t heard any more news since that image was taken. Hopefully we’ll have more images of the surface of the asteroid soon. As you can see in these and earlier shots, the asteroid’s surface is littered with rocks and boulders. The entire asteroid is a “rubble pile”; it’s not a solid monolith but instead a collection of rubble held together by its own gravity. This is likely due to many relatively slow-speed collisions with other asteroids over the eons, and we think many if not most small asteroids are like it. 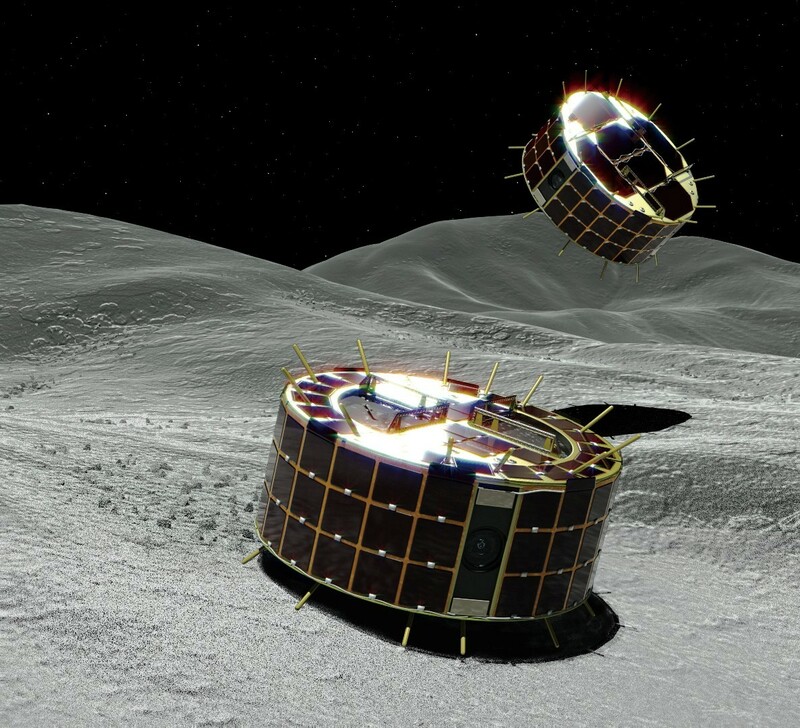 Studying Ryugu up close will be a huge leap in our understanding of asteroids. And this is a near-Earth asteroid, making it even more critical. In fact, it’s a Potentially Hazardous Asteroid, the meaning of which should be clear: It has the potential to get close enough to Earth to (possibly) impact. No impact is predicted for a long, long time, but PHAs are classified this way if they are of a certain size and can get within about 7.5 million kilometers of Earth. If we ever do see an asteroid like this getting uncomfortably close, it would be nice to know what to do about it. But it might be iron, or one giant rock, or a rubble pile like Ryugu. How we move it could depend on its structure (for example, slamming it with a probe could move it efficiently, or it may have a smaller effect depending on how tough the surface is), so understanding these rocks is very important. And we’re not done yet! The MINERVAII-1 rovers have just started their journey, and two more landers are due to be deployed by Hayabusa-2 in the coming weeks. Stay tuned! There’s a lot of asteroidal adventure yet to come. * NASA landed the NEAR-Shoemaker spacecraft onto the asteroid Eros at the end of its mission in 2001. The European Space Agency landed Philae and eventually the main spacecraft Rosetta onto the surface of the comet 67P/Churyumov-Gerasimenko in 2016. JAXA attempted to drop a small lander onto the asteroid Itokawa in 2003, but that failed; the main spacecraft Hayabusa (the first one, note this one at Ryugu is Hayabusa-2) landed twice on Itokawa and sent back a sample of the asteroid to Earth.